As the carboniferous period drew to a close, the tropics began drying up. 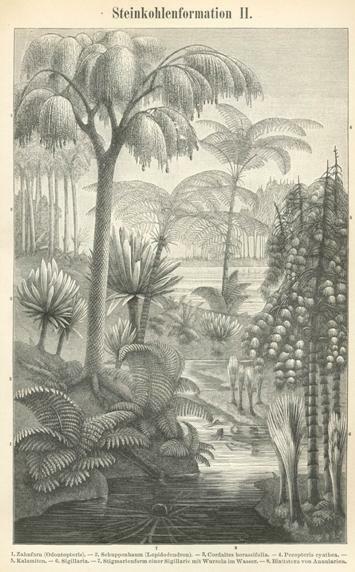 The swampy equator-spanning rainforests of clubmosses, ferns and horsetails were gradually fragmented and replaced by communities of seed ferns and arid-adapted conifers. Amphibian diversity was on the decline and the amniotes – better equipped for dealing with the trials of a dry world – were well on their way to becoming the dominant vertebrate group on land. In this post, we shall consider the early evolution of an important clade of Amniotes that includes modern mammals as its only surviving members – the Synapsids. Primitive or “basal” synapsids from the late carboniferous and Permian periods are often referred to informally as “pelycosaurs” – although the term has fallen into disfavor of late among paleontologists for various reasons, it rolls off the tongue easily and is convenient for our purposes, and so we shall use it. Crudely put, the Pelycosaurs represent the very first step on the road to mammalhood in the reptile-to-mammal transition. 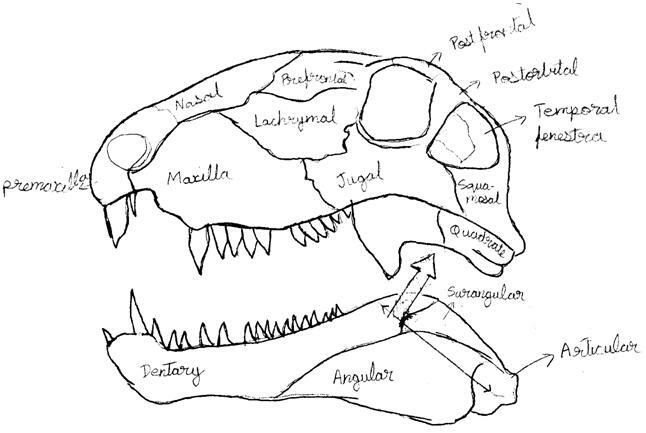 Pelycosaurs are distinguished from non-synapsid amniotes by a number of features, the most important of which is the presence of one hole on each side of the skull behind the eye-orbit, bounded above by the post-orbital and squamosal bones. These holes are called temporal fenestrae. A diagram will be instructive. By contrast, other early amniote skulls bear either no holes (anapsids), two holes (diapsid) or a single highly placed hole (Euryapsid, similar to the synapsid condition, but differing in the location of the hole) behind each eye-orbit. The temporal fenestrae provide secure anchorage points for muscles associated with jaw function. Pelycosaurs share a number of other general skull features. For example, the back of the skull slopes forward and the post-parietal bone is small and single rather than paired. These minor anatomical details need not concern us unduly here – and we shall take a cursory tour through the anatomy of the most famous Pelycosaur, Dimetrodon, in the closing section of this essay. The skeletons of pelycosaurs are structurally quite similar. What did they look like? What did they eat? Although Pelycosaurs shared a closer phylogenetic affinity with mammals than with crocodiles or lizards, there was little externally mammalian about them. They were sprawling, scaly, ectothermic creatures and, if you discovered one ambling through your backyard, you’d probably class it, quite understandably, among the reptillia. Archeothyris is among the earliest known pelycosaurs. It was a lizard-like creature, about 20 inches long with short limbs, a long snout and a number of slightly enlarged canine-like teeth towards the front of the mouth. Another early pelycosaur, Eothyris, had two pairs of very large teeth protruding from the upper jaw. These dental features suggest carnivory. Here we see the beginnings of differentiation in the structure and function of the teeth among synapsids (more ‘primitive’ tetrapods have teeth that are essentially identical in terms of morphology) – an evolutionary process that would ultimately lead to the organization of the teeth, in modern mammals, into distinct morphological types: incisors, canines, premolars and molars. The Caesids were herbivorous pelycosaurs. They had large nostrils and a shortened lower jaw. The body is almost comically large in comparison to the skull. This is a mark of herbivory – the enlarged, barrel-shaped ribcage housed a gut that was used as a chamber for the bacterial fermentation and digestion of large amounts of plant matter. The teeth are spatulate rather than pointed. A second set of teeth project from the palate and probably worked in concert with a muscular tongue to grind down food. And the low position of the joint between the lower jaw and the skull (below the tooth row) has been interpreted as a marker of increased bite force. These adaptations are all geared towards the processing of vegetation. 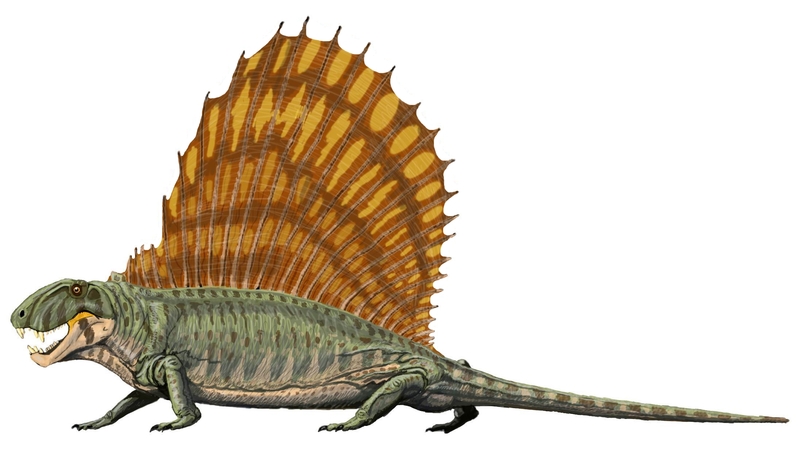 Dimetrodon, the most celebrated and best studied of all the pelycosaurs, is a member of the Sphenacodontia. Dimetrodon was a large, apex predator that dined on everything from sharks to large land-going amphibians. Dimetrodon made an appearance on Henry Levin’s Journey to the Center of the Earth (1959). Instead of the standard 50s claymation, the viewer is treated to some hilariously awful footage of iguanas tromping around with sails taped to their backs. Set to the right music, however, these absurd scenes acquire new and profound meaning. Check 1:08 of this video. Woah, trippy. The largest species of Dimetrodon hit a length of about 4 meters from nose to tail – making it the biggest land predator of its time. We shall begin our brief overview of the animal’s skeletal anatomy with the skull. Dimetrodon was an animal with a long, high snout. We notice the large opening behind the orbit, common to all early synapsids – the temporal fenestra. A sketch of the skull of Dimetrodon. The large arrow indicates the direction of force exerted by the jaw adductors while the double-headed arrow between the joint and the coronid eminence indicates the moment arm of the force. The human jaw consists of a single bone, the dentary, which connects with the temporal bone of the skull. In Dimetrodon, however, the jaw is composed of multiple bones, of which the dentary is only one. Instead of the dentary-temporal bone connection seen in humans, we have a joint between the articular bone of the mandible and the quadrate bone of the skull. In an astonishing evolutionary transition, well-supported by the fossil record, the articular and quadrate bones would eventually be incorporated into the anatomy of the ear as ear ossicles (the malleus and incus; bones that help in the amplification of vibrations received by the ear-drum) in mammals. The dentary would ultimately come to be the sole bone in the mammalian mandible. The position of the jaw-joint is noticeably lower than the tooth-row. The low placement of the joint lengthened the ‘moment arm’ of the force delivered by a set of muscles called adductors, which pull the jaw up and backwards, closing it. As a consequence, the torque experienced by the jaw as it snaps shut is greater. The back of the jaw is expanded into a “coronid eminence” to provide additional surface area for the attachment of muscles. These structural features of the jaw and its associated musculature, combined with the sturdy construction of the skull, enabled Dimetrodon to effectively snag and hold onto large, struggling prey with its mouth. Dimetrodon walked with a sprawling gait, similar to that of many modern reptiles. The humerus and femur projected almost horizontally from the shoulder girdle and pelvis respectively. Rotation along the long axes of these bones (which moved the lower limbs through a broad arc) was important for locomotion. Units called “intercentra” were present between the vertebrae – these intervening skeletal elements were lost over the course of amniote evolution in both synapsid and non-synapsid lines. Thermoregulation? Modern reptiles have evolved an interesting complement of biological adaptations to maximize the rate at which their bodies absorb heat and minimize the rate at which they lose it. This involves things like adjusting the distribution of blood flow in the body and controlling body color. Some reptiles also have bodies that are large enough to effectively store thermal energy due to their low surface-area-to-body-volume ratios (think dinosaurs or certain modern crocodilians), a trait called “Gigantothermy”. The sail of Dimetrodon was, in all likelihood, well-supplied with blood vessels and may have acted as a powerful heat-exchanger. Dimetrodon could have basked with its sail positioned laterally to the sun’s rays, soaking up heat energy like a solar panel. The speed with which the animal could heat up, thanks to its sail, may have given it certain advantages over its poikilothermic prey. Dimetrodon might have achieved the minimization of unwanted heat-loss from the sail by methods similar to those employed by reptiles today – by varying the blood supply to the sail or by adjusting the coloration of the sail. Later Dimetrodon species were certainly large enough to maintain a constant body temperature over extended periods of time by mere virtue of their body size. Here we see a possible early trend towards the regulation of body temperature in the remote ancestors of modern mammals. Sexual display? The sail may have been a colorful sexual display used to attract potential mates. Examples of such secondary sexual characteristics that determine mating success are common throughout the animal kingdom, from the sail-like dorsal fins of certain mollies to the tail feathers of peacocks. It is unfortunate that we will never know what colors painted the strange sails of these pelycosaurs. Other explanations involve the sail’s utility in swimming (where it really would function as a “sail” of the naval variety) or as a means of camouflage among the reeds, though these seem somewhat unlikely in my opinion. 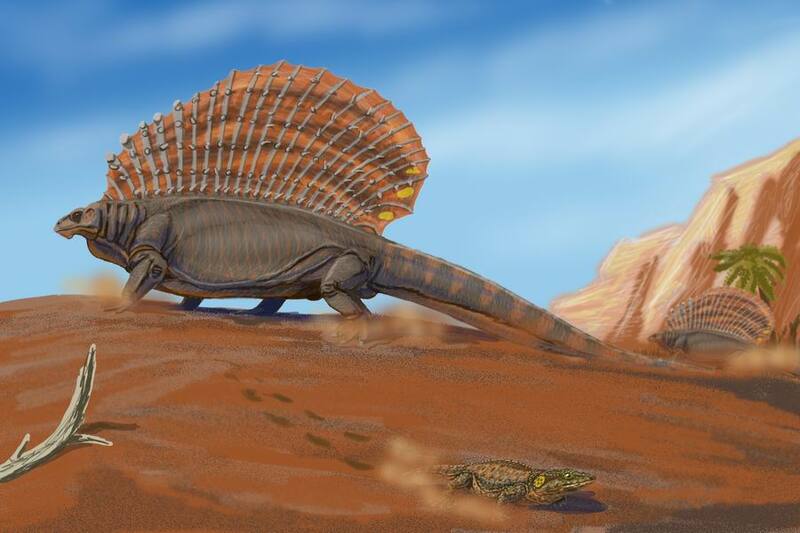 The Sphenocodontia (the group to which Dimetrodon belongs) were ancestral to modern mammals (though the Sphenocodontid ancestor of mammals almost certainly did not bear a sail). The story of mammal origins is long and complex – but with our coverage of the pelycosaurs, we have set the stage for the next major leap – the origin of the Therapsids! 4. Van Valkenburgh, B. L. A. I. R. E., and I. Jenkins. “Evolutionary patterns in the history of Permo-Triassic and Cenozoic synapsid predators.” Paleontological Society Papers 8 (2002): 267-288. 5. Benton, Michael J. Vertebrate palaeontology. Wiley. com, 2009. Hi – if you look to Prehistoric Trackways National Monument you see that the trackways of the Pelycosaurs actually are not sprawling. made all the difference in my life. I was more than happy to find this website. I need to to thank you for ones time for this particularly fantastic read!! saved to fav to check out new things on your website. Је suis arrivé sur ton poste par hsard puis ʝe ne le гegrettе point !! Euh êtes vous sûr de ce ԛue vous diteѕ ?